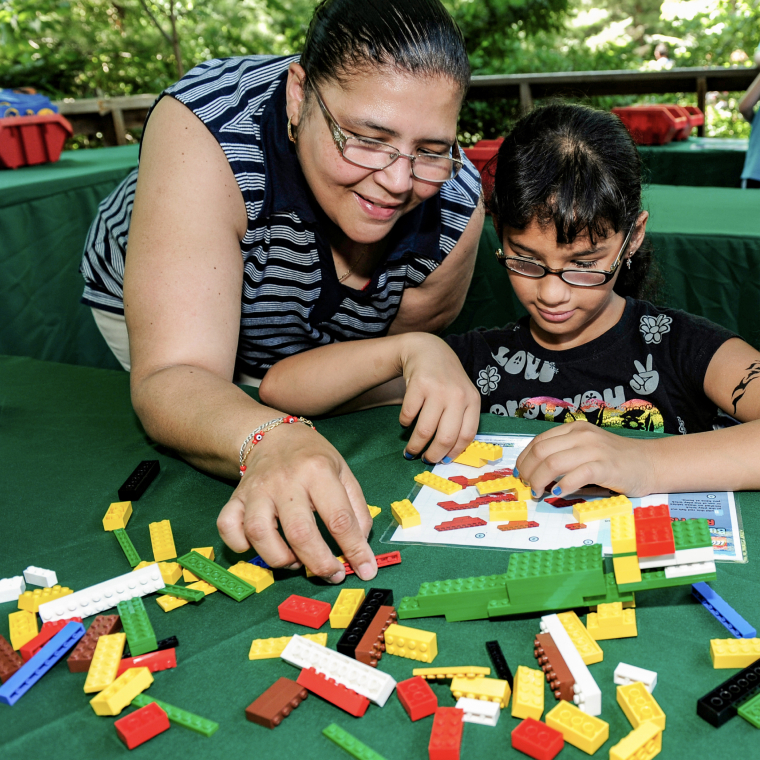 Join LEGOLAND® Discovery Center Westchester's Master Model Builder as he leads hands on dinosaur and LEGO® mosaic build activities! 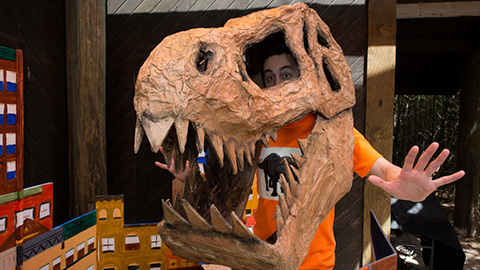 Take our quiz to get your inner dinosaur and then dress up like it for a weekend of fun. 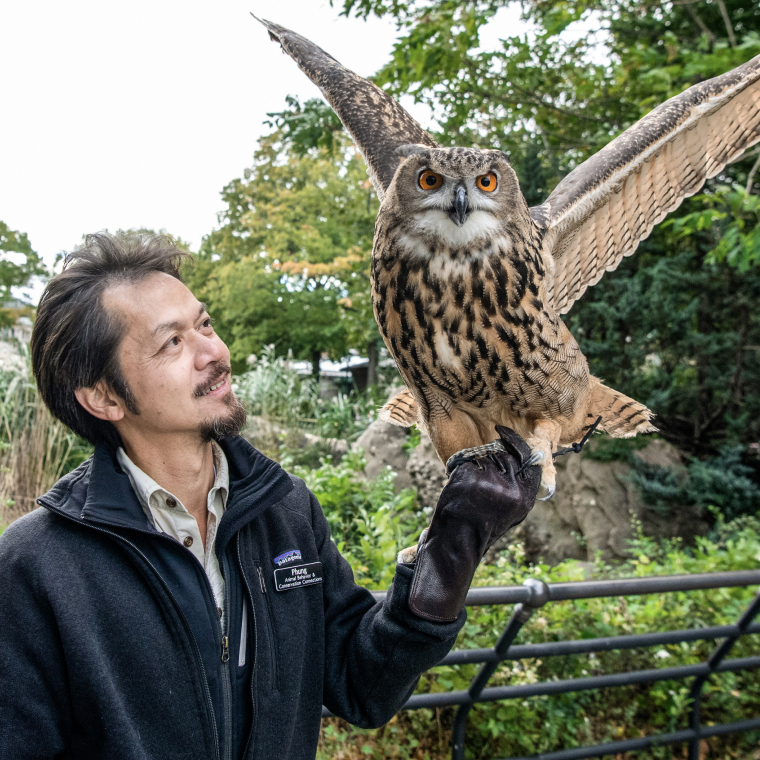 Come dressed to impress and join us on a parade through the zoo. 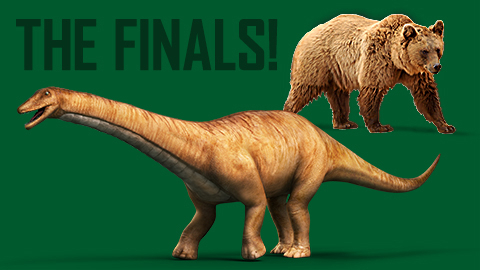 Finalists from the area will put their dino knowledge to the test during this dino-themed spelling contest. Wildlife Theater presents the story of two heroes, Cope and Marsh, as they find out the truth about animal adaptations. As a WCS Member, you get the chance to see Dinosaur Safari first. Plus, enjoy these unique benefits just for you. *For PLUS, Premium and Conservation level memberships only. **Excludes Sat, June 1 & Sun, June 2. 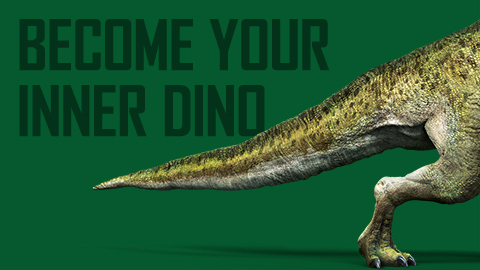 Receive a discount* on Dinosaur Safari tickets starting April 19. *Free for Conservation Supporter levels and above. 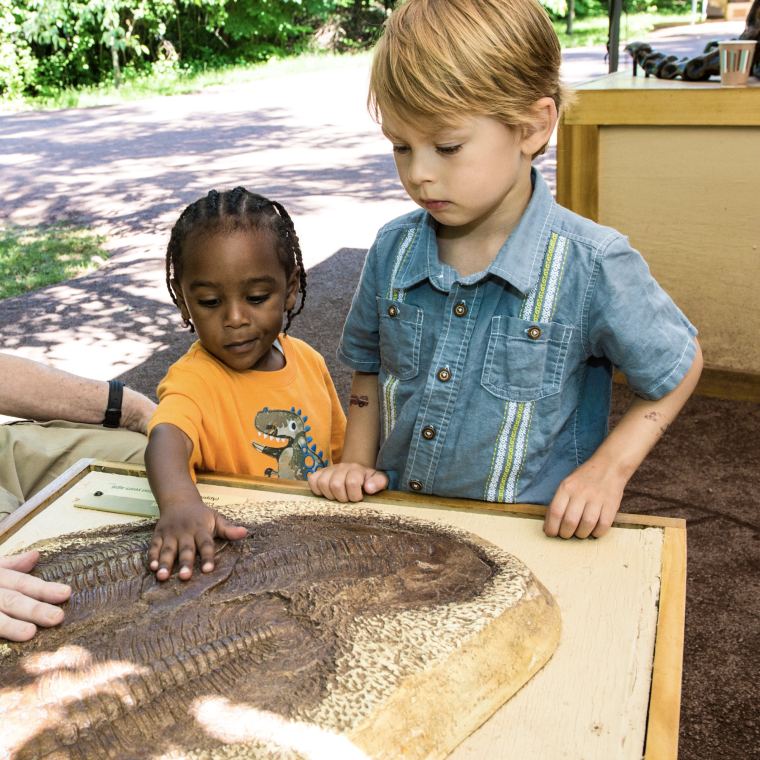 We're excited to see you at Dinosaur Safari! Before you visit, please read through the FAQs. See you soon. Is this included in my zoo ticket? 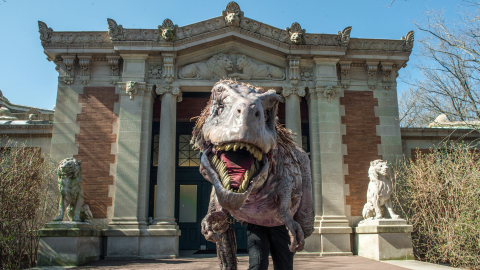 Dinosaur Safari ride is a temporary exhibit and tickets are required. WCS Members: Discount ride tickets for WCS Members ($4 per person). Member discount available for the quantity of guests covered on the membership. Free for Conservation Supporter level and above. All are welcome. Guests ages 3 and up must have tickets. We do not intend this to be a scary experience. However, some elements may be surprising to young children. The ride includes extremely large (life-size) animatronic figures, loud animal sounds, and occasional unexpected jolts. There are some mildly graphic scenes, such as a realistic portrayal of predator behavior- including a dinosaur carcass. Is this ride wheelchair accessible? Yes. A wheelchair lift is available for transfer onto the wagons. Manual wheelchairs and small electric wheelchairs can be loaded onto the lift for the wagon (max 600 lbs). Guests with mobility concerns can also utilize the lift as alternative to stairs and transfer onto a wagon bench. 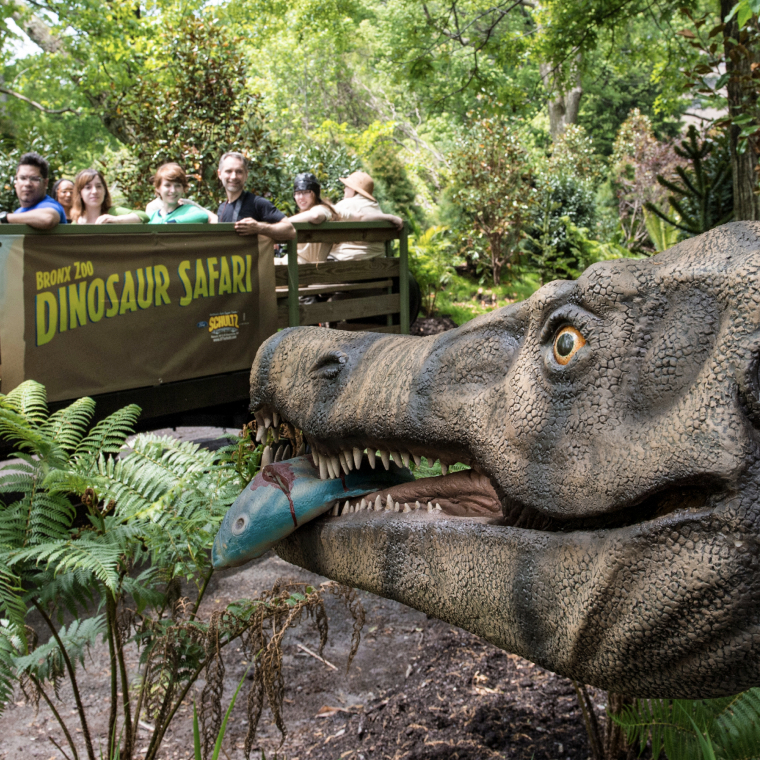 Please speak to zoo staff at the Dinosaur Safari ticket booth for assistance when you arrive at the boarding area. Does the ride run in the rain? What is the ride vehicle? Guests will be riding in an open-top wagon. Loading onto the wagon is up a short set of stairs - please hold onto the railing as you climb. Seating is on continuous benches around the sides, and a row up the center, of the wagon. Guests must stay seated at all times, and keep arms, legs and all belongings secured inside the vehicle. Children must be seated safely and cannot kneel or stand on the benches. Are these dinosaurs "life size"? Do they make noise? Yes! 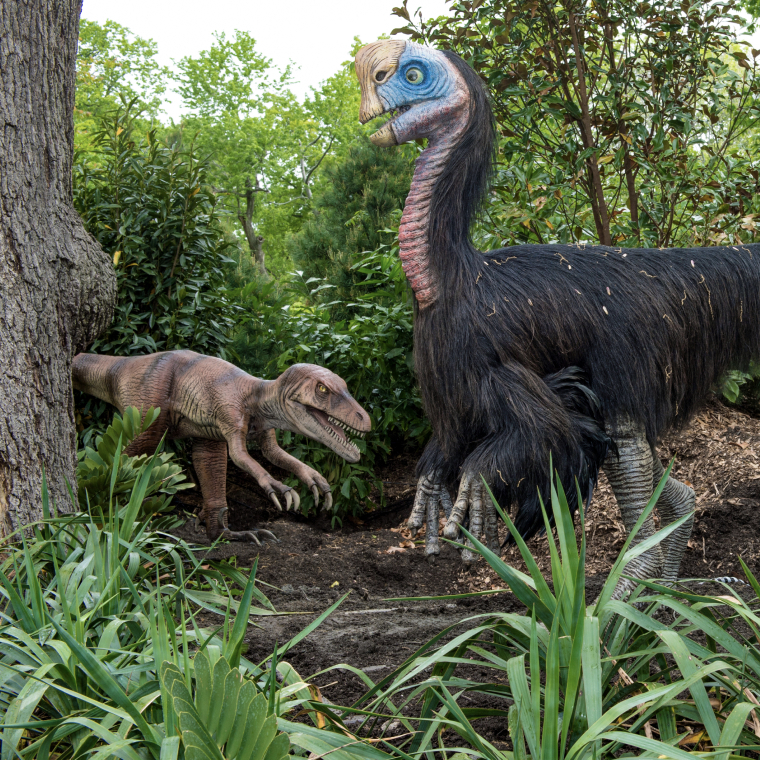 Our dinosaurs are life size, are animatronic, and will move and make noise throughout the experience. Snacks and souvenir carts are available at the Field Site zone, at the end of the ride. Are there bathrooms close by? We recommend using a restroom prior to heading over to the Dinosaur Safari ride. There are no restrooms in the immediate area. The nearest restrooms are at Madagascar! exhibit or near Tiger Mountain. Check your zoo map, or use our mobile-friendly site to locate restrooms. When is the ride open? The ride is open during regular zoo hours. April 19 – Nov 3: Weekdays, 10am – 5:00pm; Weekends 10:30am – 5:30pm. Availability is subject to weather, capacity, mechanical issues or other unforeseen circumstances. Dinosaur Safari ride loading is at Fountain Circle, in the north side of the park near Astor Court. The ride goes around a back area of the zoo and end at the Field Site zone, adjacent to Fordham Road gate.